Today is The South Bay’s premier food and craft beer pairing event, the first annual Bite at the Beach, presented by Stella Artois, and an effort to raise funds for the Surfrider Foundation. After taking your leave of the white tents, at which you’ve been presented with a charming tasting glass (with the Stella Artois logo emblazoned across) and plate combo, music and a loudspeaker cull you onward, and it isn’t long before the savory and sweet aromas of simmering seafood, juice-dripping meat, and buttery sliders being prepped under the cool shade of an E-Z Up collective devour your remaining inhibitions. And therein lies quite the quandary, because at each restaurant’s station, paired for palate perfection, is a craft beer specially chosen to remap everything you thought you knew about food. Put another way, there are twenty-three different stations, meaning twenty-three different types of food to sample, with some stations pouring up to four different types of beer! With breweries ranging from Shock Top to Goose Island, and restaurants such as the Mediterranean-styled Sesame Moe’s and Paul Martin’s American grilled cuisine, it is difficult to really know where to start… so I go with what I know: Ballast Point. Weaving through the still relatively light crowd of patrons, I approach a white E-Z Up manned by a trio of black shirts who are more than happy to fill up my still-empty (and thus free of competing beer remnants) Stella glass with a Sculpin IPA. Before heading over to a nearby bench, I make sure to snag my first sampling of food: the New Orleans BBQ shrimp and RockN’ crab cake topped with a dollop of spicy rémoulade, courtesy of Manhattan Beach’s Rock’n Fish. The IPA, which I’ve “sampled” in the past, proves to continue its reign over my taste buds: the hops bubble and dance, but are not so overpowering as to turn off the casual imbiber. The color, a fine rustic orange underneath a light cream-white head, almost shimmers in spite of a thin cloudiness. In the first gulp, it’s as if one’s body is being dipped into a lavender-soaked pool, while perfumed grapefruit tickles the senses. 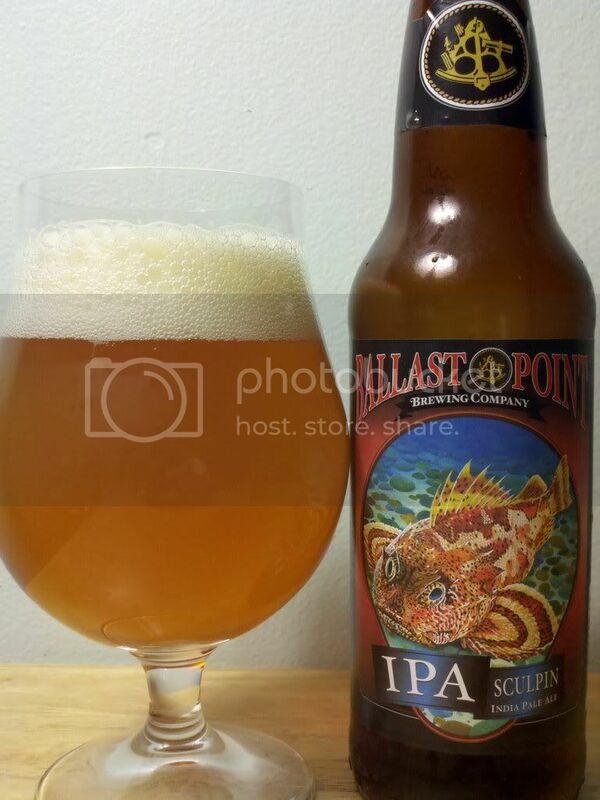 Although the accompanying crab cakes do little more than highlight the Sculpin’s malty complexity, it’s the BBQ shrimp (dubbed “Hot & Spicy” on the restaurant’s menu) that seizes the day with its magical manipulation of hops. It has an eloquent burn that will see lighter beer drinkers through the IPA’s bitterness, while those who don’t want to have their hand held through the worst of it won’t feel as if they’re being cheated. Next up is the La Grisette ale from Agoura Hills’ Ladyface, coupled with a pomegranate cous cous with lavender feta, marcona almonds, grapefruit, and mint, courtesy of MB Post (Manhattan Beach Post). What I immediately love about the Grisette is how real the experience of it is—a farmhouse wheat ale, you can practically taste the Belgian yeast spitting out of a fizzy white head. It’s definitely one of the more refreshing samplings of the evening, easy to drink, and very relaxed in demeanor. Now, usually when it comes to cous cous, I’m not the biggest fan. But here I can honestly say that the sampling provided by MB Post is interesting. It will probably be a home run with people who already enjoy cous cous … but to me there is still a particular blandness to the dish that I just can’t shake, despite a fun collage of color provided by its eclectic assortment of ingredients. However, I would also like to add that I do find an irrepressible enjoyment out of the marcona almonds, which, when paired with the laid-back Grisette, is very satisfying by itself. Hop-scotching to dessert, I press onward to the Fishing W/ Dynamite stand. Resting in an array of sampling cups, the restaurant’s deceivingly simplistic key lime pie is anything but. With a graham cracker crust and caramelized cream topping, there’s no use appealing to metaphor: it’s just as good as it sounds. 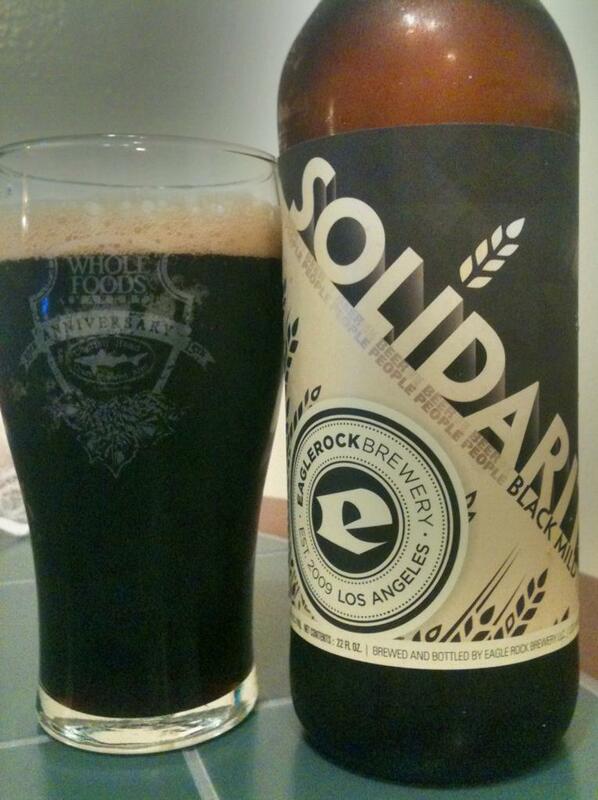 But the pairing of it and Eaglerock’s Solidarity Black Mild is a different story. Taking a bite of the dessert, I revel in unsolicited prurience as the Solidarity melts away the tangy remnants into a nutty, expressively espresso-noted delicacy. To be fair, there are times when the key lime would overpower the beer well into the second or third sip, but when it finally does work its magic the effect is nothing short of inspiring. As happens with any well-thrown event, every so often we’ll find a misstep. One that can be easily rectified as in the case with the fourth tasting of the day, the Manhattan Beach Creamery and newcomer Ohana Brewing Company. The set-up: a pale ale juxtaposed against the Peanut Butter Maple Bacon Cream’wich. It’s a strange pairing simply because it confounds how hops and peanut butter, or even the sweeter tones of maple syrup, could possibly go well together. And of course they don’t. The peanut butter cookie holding the cream’wich together completely overpowers both the maple bacon and pale ale, drawing grimaces rather than smiles with a relentless nipping bite that nags instead of excites. Most apparent is a sweet bitterness, but in the way you might consider something is “off” as opposed to intentional. It’s disappointing to be sure, but perhaps more so for the brewer—I had a very hard time deciphering the finer notes of the beer for the rest of the sampling after only two bites of the cream’wich. In a delightfully unexpected true story of “saving the best for last”, the Alosta Brewing Company and Darren’s Restaurant can stop their search for true love. Nearly taking up the entire complimentary Stella plate are helpings of the restaurant’s Hawaiian Ahi Poki, Spicy Mussels, and the Sweet n’ Spicy Lobster chowder. In the glass is an Alosta Farmhouse Saison, its rich amber hues glowing with organic resonance against the smiling sunshine. Now it’s time to take a glimpse into the twilight zone. I’m going to go ahead and skip over discussing the Poki and Spicy Mussels, not because they aren’t tasty (they were, although identical entrées could be found at the Salt Creek Grille and Pitfire Pizza stands), but because their experience is so wholly eclipsed by that of the lobster chowder. Putting a spoonful of the soup to my lips, I barely discern the “wow” that escapes my lips as I’m first waylaid by a surprising sweetness… then completely bowled over by a dump truck when the savory spices kick in. WOW. A couple next to me and my guest immediately perk up and ask what it is I just tried. I tell them. They get up to go find the stand. But it isn’t over until it’s over, and I feel a slight trepidation upon introducing the amber hued glass to its partner. Nothing can quite describe what it is like to have your taste buds spontaneously combust when fruity esters and sanguine maltiness combine with savory lobster in an onslaught of flavor that this master combo brings on, so I won’t bother. But if today had a winner, this was it. All in all, I would say that Manhattan Beach’s first annual Bite at the Beach was largely a success: great food, great company, a very sociable atmosphere, and a wonderful opportunity for chefs and craft brewers to not only share great food & drink, but for a good cause. At $100/ticket, or $200 for a VIP pass, the cost can be a little steep for some—my guest and several others shared a consensus that the pricing was heavily imbalanced when compared with other beer and food festivals, among other things—but if you can get past that, and are looking to mingle, keep an eye out for Bite at the Beach 2015. The Surfrider Foundation is a nonprofit grassroots organization dedicated to the protection and enjoyment of the world’s oceans, waves and beaches through a powerful activist network. Founded in 1984 by a handful of visionary surfers in Malibu, California, the Surfrider Foundation now maintains over 250,000 supporters, activists and members worldwide. Tyler Dean is a recent graduate from Cal State University, Long Beach, with a Bachelor’s degree in Film and Electronic arts, emphasis on Film Screenwriting. A California native all his life, it would be in the Golden State that Tyler would pen several screenplays, a number of which have been turned into short films, and one a feature film that premiered in 2012 with the help of co-writer Jacob Whitley. Not only an avid filmmaker, but a fan of cinema as well, Tyler says he attributes his love of film to a host of influential professors from his years at Saddleback Community College and CSULB, and the Criterion Collection—an organization that seeks to preserve important, influential, and landmark films. Finding that the corrosive limitations of strict procedural journalism forbade his written work from bearing fruit in the publishing world, Tyler came to "A Taste of Dawn" because of its wanton desire in seeing the writer as an artist, one with a voice that deserved to be heard. Tyler is currently working on his next film project—a sci-fi mystery-thriller about an amnesiac and his journey of self-discovery, after waking up on an abandoned space station in the middle of nowhere.